Enjoy a peaceful start to your Big Island trip with a shared transfer to your hotel in Kona, Hualalai, Keauhou, Waikoloa or Mauna Kea from Kona International Airport. A driver will greet you at baggage claim and lead you to your Kona airport shuttle, providing comfortable transportation to your accommodations. Upgrade to the lei option to be greeted with fresh flowers around your neck. Please note that you must select a hotel that coincides with the areas in the Itinerary listed below, otherwise your booking will be cancelled. A convenient, hassle-free way to begin your vacation! Comece a sua viagem para um início relaxante com uma transferência para o seu hotel em Kona, Hualalai, Keauhou, Waikoloa ou Mauna Kea do Aeroporto Internacional de Kona. Um motorista simpático irá recebê-lo em uma esteira de bagagens e levá-lo a um ônibus de 12 pessoas com ar-condicionado. Em seguida, sente-se e relaxe enquanto sua bagagem está guardada e você é entregue diretamente ao seu destino. Este serviço está disponível 24 horas por dia, sete dias por semana para acomodar seus planos de viagem específicos. Para um verdadeiro deleite havaiano, atualize para a opção de lei e receba flores frescas da ilha ao redor do seu pescoço. Por favor, forneça os detalhes do seu hotel e voo no momento do check-out. Esta informação inclui a sua hora de chegada, o número do voo e o nome do hotel. Então, aproveite a confirmação instantânea. Observe que você deve selecionar um hotel que coincida com as áreas listadas na seção Itinerário abaixo, caso contrário, sua reserva será cancelada. My driver, Boyd, was so personable accommodating and courteous. The ride was very enjoyable and the other passengers were delightful. 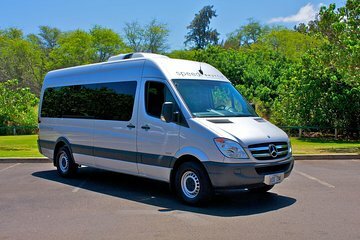 I would recommend Viator's Speedi Shuttle to anyone who enjoys a hassle free transport to their destination either to or from the Kona airport. Booking through Viator was easy and affordable. I would definitely request Boyd again. He made me feel like family. At the airport I was met by a lady holding sign with my name. Since I had checked in luggage she showed me where she will be waiting for me. It took a while to get my suitcase. When I finally got it - the lady was nowhere found. I was left wondering if the van left already or one of couple vans by curbside is waiting for me. After waiting 10-15 minutes I was on the way towards the vans to start asking questions, when the lady appeared and led me to the right van. Ride to my hotel was comfortable and good. Overall good value, still would use them for my future transfers. The Shared Arrival Transer to the Hotel was long after a long flight. On the way back we called Uber much better idea. The cost was about the same and much quicker. Our flight was late for 20 min.The speedy shuttle did not wait us and had gone. We found the person in airport, who was responsible for our meeting. It had taken for us 15 min to find him, as we did not see any noties in airport which can explain us to whom we have to deal. She ordered extra shuttle for us and finally after one hour after our arrival we started to drive to our hotel. Had a packed vehicle, and had to wait a while to get loaded. We had to get directions from security where to find the ride.